And they could hold secrets of alien life there, too. 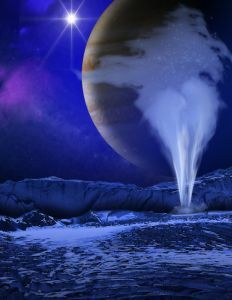 For almost two decades, researchers have suspected liquid water lies below the icy shell of Europa, one of Jupiter’s moons. Now, a new study in Nature Astronomy not only proves they were right, but also confirms that it does something more awesome than they could have imagined: it shoots up out of the crust in big, beautiful plumes. Liquid water is, more or less, what NASA looks for when it decides what celestial body to explore next. That’s because water is thought to be one of the necessities for life, because, let’s be real, finding life on other planets is pretty much the whole reason humans are so fascinated by space in the first place. And while NASA already has plans to explore Europa, this is the most heartening sign of life that planetary scientists have been waiting for. Even crazier? We’ve had the data proving that the plumes exist since 1997. Galileo, the spacecraft sent to gather information about Jupiter and its moons that plunged to its demise in 2003, collected it way back then, but scientists have only just now gotten around to analyzing the truly monumental pile of data. Xianzhe Jia, a planetary scientist at the University of Michigan, heard astronomers suspected the plumes sat on the moon’s equator, but couldn’t get a good look at them with the Hubble Space Telescope, he told NPR. Jia, however, had worked with Galileo’s data when he was a graduate student, so he had a good sense for the kind of data the probe typically collected. When Jia and his team sifted through the observations of plasma and magnetic wave fluctuations Galileo picked up on Europa, Jia and his team were able to confirm that, yes, the geysers did, in fact, exist. That’s particularly exciting because it also suggests that Europa may have an energy source propelling the water skyward. That’s another requirement for life that might be checked off the list — in fact, some scientists theorize that life on Earth started in the deep sea vents that erupt in geysers. For the most part, NASA doesn’t bother searching for life in solid water (that is, in ice) because molecules don’t flow as freely. But researchers suspected that Europa may have lakes under its icy crust that made it worthy of investigation. That’s why NASA has already spent years planning the Europa Clipper to investigate the moon for liquid. The geysers make the mission’s job much easier. Not only do the plumes suggest that subsurface ocean likely exists, but it also means the Clipper, and any future mission, can just fly through the spewing mist for a sample, instead of hacking through the icy crust. Now that we have the geysers to sail through, some of Clipper’s gear, like the instruments meant to detect the tiniest traces of water in the atmosphere, might not be as useful as NASA thought it would be. Otherwise, Clipper will be taking full advantage of the waterworks. A radar device will look past the ice for hidden lakes, and the craft will also learn how deep and salty the water is based on the moon’s magnetic field. Clipper isn’t slated to launch until the 2020s. That might seem far away, but new information about the geysers may give NASA a chance to reconfigure the scientific tools and goals of the spacecraft. And now that the geysers have whet our thirst for more information, whatever Clipper finds will be worth the wait.